Every week, it seems, there’s a new breakthrough in 3-D printing that promises us the ability to (eventually) fabricate some new thing in one of those glass-walled wonder boxes. Such things have included everything from spare parts for the International Space Station above to the beef on our dinner plates to the organs inside our bodies. Although this last idea of fabricating body parts may seem the most fanciful, a team of scientists is reporting a breakthrough in 3-D printing using human embryonic stem cells that could purportedly lead to life-like bioengineered tissue and, eventually, artificial organs tailor-made for specific patients. Researchers have been able to engineer tissue samples in the past by combining artificial scaffold-like structures and animal cells. Depositing human embryonic stem cells in cultures using a 3-D printer offers some advantages. In particular, the cells can be positioned in droplets of uniform size cheaper, faster and more easily than using manual methods. This uniformity is important for researchers trying to generate specific cell types. Whereas human embryonic stem cells have proved too fragile to print in the past, scientists at Scotland’s Heriot-Watt University and Roslin Cellab, a stem cell technology company, say they have developed a new technique that allowed them to deposit droplets of a consistent size containing living cells that survived the process and maintained their ability to develop into different types of mature cells. The research will be published Tuesday in the journal Biofabrication. In the 3-D printing process, generally a nozzle resembling an inkjet deposits thin layers of resin or a polymer that hardens—either naturally or after being sintered by a laser—into a particular structure. 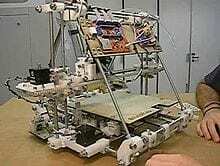 So-called “bioprinters” naturally use cells rather than plastics to create organic structures. However, this technique can damage the printed cells, so the Heriot-Watt and Roslin Cellab scientists developed a printing system driven by pneumatic pressure and controlled by the opening and closing of a microvalve. The researchers could precisely control the amount of cells dispensed by changing the nozzle diameter, the inlet air pressure or the opening time of the valve. The scientists acknowledge that other researchers have in the past printed mouse embryonic stem cells and even certain types of human stem cells. Human embryonic stem cells, although more sensitive to physical manipulation, can generate a wider variety of specific cell types than other forms of human stem cells. In addition, any tissue formed would yield better models of human biology than those formed from mouse cells.